I bought the kids some new sand toys the other week so they were pretty excited to head to the park and play in the sand. They were awfully disappointed though when the dry sand wouldn't hold the shape for their new molds. I decided to try making some homemade moon sand to see if that would bring more fun. It was a huge success! I bought a bag of nice clean sand from Home Depot for about $3 and a box of corn starch for $1 at Walmart. We measured out 8 cups of sand and 4 cups of corn starch into a 32 quart plastic bin that I just had sitting in the basement. We mixed them together with 2 cups of water and we were ready to play. My kids were so excited that it actually worked to build sand castles. And even more excited that they could make some little "sand cookies" with the new sand toys we had bought. And of course we had to fill up the big bucket for the ultimate sand castle. This recipe is definitely a keeper. 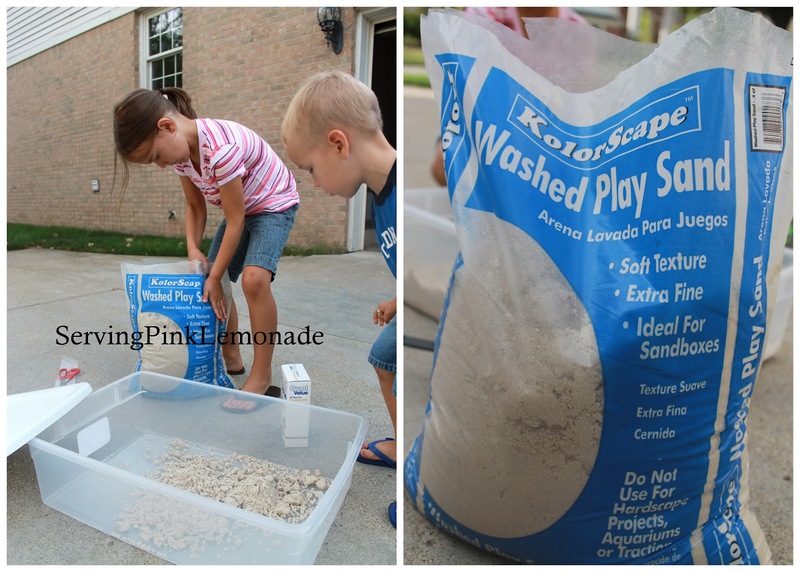 My kids had so much fun playing with the moon sand, and I won't lie, I had fun playing with them too! Combine all ingredients in plastic container. Store with lid off or it may become moldy. 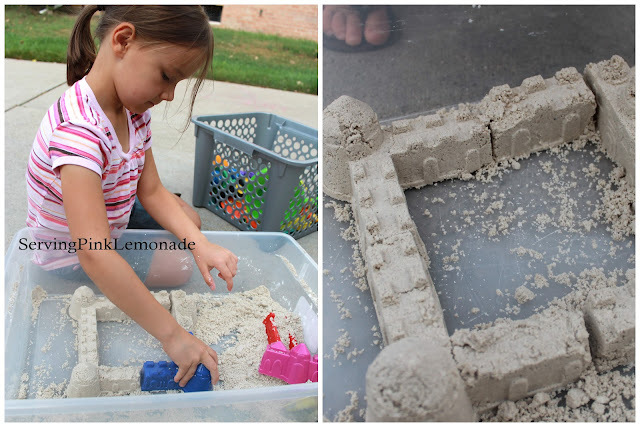 If moon sand dries out before the next play session add more water to moisten. Have you tried the commercial moon sand before? How about homemade moon sand? That's genius. I need to try that. I am not a fan of Moon Sand from the store, but your version looks great! I have never heard of moon sand, presumably the corn starch makes it ideal for building castles? You know.. we have never even tried "real" moon sand... mmmh, maybe we should? We are SOOOO doing this tomorrow! Thanks for the idea!